The Dune prequel series is a sequence of novel trilogies written by Brian Herbert and Kevin J. Anderson. Set in the Dune universe created by Frank Herbert, the novels take place in various time periods before and in between Herbert's original six novels, which began with 1965's Dune. In 1997, Bantam Books made a $3 million deal with the authors for three Dune prequel novels, partially based upon notes left behind by Frank Herbert, that would come to be known as the Prelude to Dune trilogy. Starting with 1999's Dune: House Atreides, the duo have published 11 Dune prequel novels to date. In 2011 Publishers Weekly called the series "a sprawling edifice that Frank Herbert’s son and Anderson have built on the foundation of the original Dune novels." Dune itself is frequently cited as the best-selling science fiction novel in history. It won the 1966 Hugo Award and the inaugural Nebula Award for Best Novel, and was later adapted into a 1984 film as well as a 2000 television miniseries. Herbert wrote five sequels, and the first two were presented as a miniseries in 2003. Herbert himself died in 1986. Brian Herbert and Anderson have also published Hunters of Dune (2006) and Sandworms of Dune (2007), sequels to Frank Herbert's final novel Chapterhouse: Dune (1985) which complete the chronological progression of his original series and wrap up storylines that began with his Heretics of Dune (1984). Prelude to Dune is a prequel trilogy of novels written by Brian Herbert and Kevin J. Anderson, set in Frank Herbert's Dune universe. The series takes place in the years leading up to the events in the original novel Dune (1965) and explores the origins of some of its characters. In 1997, Bantam Books made a $3 million deal with the authors for three Dune prequel novels that would come to be known as the Prelude to Dune trilogy. The novels draw from notes left behind by Frank Herbert after his death in 1986. As the Prelude to Dune series begins, an impatient Crown Prince Shaddam is plotting to end the reign of his father, Padishah Emperor Elrood IX, by any means possible. Young House Atreides heir Leto becomes close with the ruling family of the important technology world Ix, but the ensuing intrigue surrounding a Tleilaxu takeover of Ix makes Leto an enemy to Shaddam. Very close to their goal of producing a Kwisatz Haderach, the Bene Gesserit scheme behind the scenes to secure their influence; the virile Baron Vladimir Harkonnen crosses them and pays a heavy price. Suk doctor Wellington Yueh, the Bene Gesserit Lady Jessica and Harkonnen enemies Duncan Idaho and Gurney Halleck ally themselves with Leto, and Shaddam nearly destroys the all-important planet Arrakis thinking he has found a replacement for its priceless and essential export, melange. Dune: House Atreides debuted at #13 on the New York Times Best Seller list, and rose to #12 in its second week of publication. Dune: House Harkonnen debuted at #11 on the same list, and rose to #8 its second week. The third installment, Dune: House Corrino, debuted at #8 on the New York Times list. Legends of Dune is a prequel trilogy of novels written by Brian Herbert and Kevin J. Anderson, set in Frank Herbert's Dune universe. The series takes place over 10,000 years before the events of the 1965 novel Dune, and chronicles the universe-spanning war against thinking machines that would eventually become known as the Butlerian Jihad. It also explores the origins of the families and organizations that populate the distinctive universe in other Dune works. The series explains that after our own time, humanity had become entirely complacent and dependent upon thinking machines; recognizing this weakness, a group of ambitious, militant humans calling themselves the Titans use this widespread reliance on machine intelligence to seize control of the entire universe. The Titans soon make the transition into cyborgs called cymeks; through the use of specialized interfaces, their brains are installed inside giant, mobile, mechanized "bodies." These fearsome, weaponized bodies make the Titans virtually immortal — and invincible. Their rule lasts for a century. Then, having mistakenly given one attendant artificial intelligence program too much autonomy, the Titans suddenly find themselves overthrown and enslaved by an AI consciousness calling itself Omnius that seizes control of the entire universe though the interconnected machine network. For over 900 years the Titans live in perpetual servitude to Omnius, cruelly subjugating humanity, quelling human insurrections and secretly plotting their own return to power. At the time of the Legends of Dune series, over 500 planets — called the Synchronized Worlds — are under complete machine control, their former human populations either enslaved or killed. The relatively few planets of remaining free humans are united under the League of Nobles, a government using what resources it has to defend the League Worlds against machine aggression. A prominent figure in the human rebellion is Serena Butler, the charismatic daughter of the League Viceroy; the murder of her young son at the hands of the independent robot Erasmus finally incites the Butlerian Jihad, with humanity mounting a decisive offense against machine rule. This crusade against the machines lasts for nearly a century, with much loss of human life but ending in human victory at the Battle of Corrin. The Jihad also gives rise to the Bene Gesserit, the Spacing Guild, the Sardaukar army, the Landsraad, and House Corrino, whose Padishah Emperors rule the universe for the next 10,000 years, until the events of Dune and the accession of Paul Atreides. Dune: The Butlerian Jihad rose to #7 on The New York Times Best Seller list in its second week of publication. Dune: The Machine Crusade debuted at #7 on the list. The third installment, Dune: The Battle of Corrin, reached #9 on the New York Times list. Heroes of Dune is a planned tetralogy of novels by Brian Herbert and Kevin J. Anderson set in the Dune universe created by Frank Herbert. The potential series was initially referred to as Paul of Dune by the authors as early as 2004. These novels were intended to "fill in the story" between Frank Herbert's early Dune novels. Half of the story of Paul of Dune takes place between Frank Herbert's Dune (1965) and Dune Messiah (1969) as Paul's Jihad rages, Shaddam seeks to regain his throne and Princess Irulan accepts the "task of building the legend of Muad'Dib". She in turn chronicles Paul's early years (between the 2001 Brian Herbert/Anderson prequel Dune: House Corrino and Dune), which feature "his friendship with Duncan and Gurney and Duke Leto's War of Assassins against Grumman". The Winds of Dune (originally announced as Jessica of Dune) chronicles events between Frank Herbert's Dune Messiah (1969) and Children of Dune (1976). The final two novels in the series were to be called The Throne of Dune (formerly Irulan of Dune) and Leto of Dune (perhaps The Golden Path of Dune). However, in a July 2010 blog post Anderson announced that these novels had been postponed due to plans by Herbert and Anderson to publish a trilogy (later known as Great Schools of Dune) about "the formation of the Bene Gesserit, the Mentats, the Suk Doctors, the Spacing Guild and the Navigators, as well as the solidifying of the Corrino imperium." In Paul of Dune, Paul Atreides's childhood lessons in the political intrigues of the empire are juxtaposed with his current struggle to secure his control over it. His Fremen armies are spread across the universe in attempt to bring rebel worlds to heel, and Paul avoids one assassination attempt only to nearly die in another. In The Winds of Dune, Paul's disappearance into the desert has left a power vacuum, and his closest advisors struggle to determine what path his empire should take. The Winds of Dune rose to #15 on The New York Times Best Seller list in its second week of publication. Great Schools of Dune is a prequel trilogy of novels written by Brian Herbert and Kevin J. Anderson, set in Frank Herbert's Dune universe. A sequel to the Legends of Dune trilogy (2002-2004), the series takes place nearly a century after the events of Brian Herbert and Anderson's Dune: The Battle of Corrin (2004), in which the Army of Humanity finally defeats the thinking machine armies of Omnius. Now, the fledgling Bene Gesserit, Mentat and Suk Schools, as well as the Spacing Guild, are threatened by the independent anti-technology forces gaining power in the aftermath of the Butlerian Jihad. The Great Schools of Dune trilogy, first discussed by Anderson in a 2009 interview and later named by him in a 2010 blog post, chronicles the early years of these organizations, which figure prominently in the original Dune novels. Though the third and final novel was originally identified by Anderson as The Swordmasters of Dune in 2009, in 2014 Brian Herbert and Anderson confirmed that its title would be Navigators of Dune. On July 27, 2015, Anderson previewed the cover of Navigators of Dune on Twitter and noted its 2016 release. In Sisterhood of Dune, the anti-technology Butlerian movement is gaining momentum under the leadership of the popular Manford Torondo. He and his forces are scouring the universe to cleanse humanity of its reliance on convenient technologies, destroying any machinery they can find. Torondo's growing power threatens the Corrino Emperor Salvador, as well as the Sisterhood on Rossak and the Mentat School on Lampadas, each of which harbors secret technology. Space travel tycoon Josef Venport also plots to salvage machinery which he believes can be useful in his business empire. Mentats of Dune finds Gilbertus Albans carefully managing his Mentat School under the watchful eye of the fanatical Butlerians, while Raquella Berto-Anirul seeks to rebuild her own Sisterhood School on Wallach IX. To secure his control of interstellar commerce and strike a blow against the Butlerians, Venport places a trade embargo on any planet which embraces Torondo's movement. Sisterhood of Dune debuted at #23 on The New York Times Hardcover Fiction Best-Seller List, and Mentats of Dune was released at #17 on the same list. Publishers Weekly called Sisterhood a "shallow but fun blend of space opera and dynastic soap opera." ^ a b c Quinn, Judy (November 17, 1997). "Bantam Pays $3M for Dune Prequels by Herbert's Son". Publishers Weekly. Retrieved February 6, 2014. ^ a b c "Fiction Book Review: Sisterhood of Dune". Publishers Weekly. November 14, 2011. Retrieved November 21, 2013. ^ "The Hugo Awards: 1966". World Science Fiction Society. Retrieved March 8, 2011. ^ "1965 Nebula Awards". NebulaAwards.com. Archived from the original on December 17, 2005. Retrieved March 17, 2010. ^ Itzkoff, Dave (September 24, 2006). "Across the Universe: Dune Babies". The New York Times. Archived from the original on October 24, 2015. Retrieved April 14, 2018. ^ Ascher, Ian (2004). "Kevin J. Anderson Interview". DigitalWebbing.com (Internet Archive). Archived from the original on July 3, 2007. Retrieved November 27, 2013. ... we are ready to tackle the next major challenge — writing the grand climax of the saga that Frank Herbert left in his original notes sealed in a safe deposit box ... after we'd already decided what we wanted to write ... They opened up the safe deposit box and found inside the full and complete outline for Dune 7 ... Later, when Brian was cleaning out his garage, in the back he found ... over three thousand pages of Frank Herbert's other notes, background material, and character sketches. ^ " "Before Dune, After Frank Herbert". Amazon.com (Internet Archive). 2004. Archived from the original on April 9, 2009. Retrieved November 27, 2013. Brian was cleaning out his garage to make an office space and he found all these boxes that had "Dune Notes" on the side. And we used a lot of them for our House books. ^ "BEST SELLERS: October 24, 1999". NYTimes.com (Internet Archive). The New York Times. October 24, 1999. Archived from the original on November 27, 2013. Retrieved November 27, 2013. ^ "BEST SELLERS: October 31, 1999". NYTimes.com (Internet Archive). The New York Times. October 31, 1999. Archived from the original on November 27, 2013. Retrieved November 27, 2013. ^ "BEST SELLERS: October 22, 2000". NYTimes.com (Internet Archive). The New York Times. October 22, 2000. Archived from the original on November 27, 2013. Retrieved November 27, 2013. ^ "BEST SELLERS: October 29, 2000". NYTimes.com (Internet Archive). The New York Times. October 29, 2000. Archived from the original on November 27, 2013. Retrieved November 27, 2013. ^ "Hardcover Fiction: October 21, 2001". NYTimes.com (Internet Archive). The New York Times. October 21, 2001. Archived from the original on November 27, 2013. Retrieved November 27, 2013. ^ a b c MacDonald, Rod (January 6, 2009). "Review: Dune: The Butlerian Jihad by Brian Herbert & Kevin J. Anderson". SFCrowsnest.com (Internet Archive). Archived from the original on June 15, 2013. Retrieved November 27, 2013. ^ Herbert, Brian; Kevin J. Anderson (2002–2004). Legends of Dune. ^ "BEST SELLERS: October 13, 2002". NYTimes.com (Internet Archive). The New York Times. October 13, 2002. Archived from the original on November 27, 2013. Retrieved November 27, 2013. ^ "BEST SELLERS: October 5, 2003". NYTimes.com (Internet Archive). The New York Times. October 5, 2003. Archived from the original on May 25, 2013. Retrieved November 27, 2013. ^ "Hardcover Fiction: September 12, 2004". NYTimes.com (Internet Archive). The New York Times. September 12, 2004. Archived from the original on November 28, 2013. Retrieved November 28, 2013. ^ Ascher, Ian (2004). "Kevin J. Anderson Interview". DigitalWebbing.com. Archived from the original on July 3, 2007. Retrieved November 27, 2013. 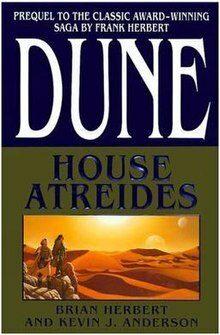 [The series] fills the gap betweenHouse Corrino and Dune: in other words, the younger years of Paul Atreides and his friendships with Duncan Idaho and Gurney Halleck interwoven with the story of Paul's Jihad, which fits between Dune and Dune Messiah. ^ "Paul of Dune". DuneNovels.com. Archived from the original on August 22, 2008. Retrieved November 28, 2013. ^ a b Anderson, Kevin J. (March 23, 2007). "Sandworms of Dune blog". DuneNovels.com. Archived from the original on October 29, 2007. Retrieved November 28, 2013. ^ a b Anderson, Kevin J. (April 14, 2008). "Dune blog". DuneNovels.com. Archived from the original on June 20, 2008. Retrieved November 28, 2013. ^ a b c Anderson, Kevin J. (November 29, 2009). "Dune blog: Official Story Chronology". DuneNovels.com. Archived from the original on November 28, 2013. Retrieved November 28, 2013. ^ a b Anderson, Kevin J. (July 15, 2010). "Brainstorming THE SISTERHOOD OF DUNE". DuneNovels.com. Archived from the original on May 18, 2011. Retrieved November 27, 2013. ^ "Best Sellers: Hardcover Fiction". The New York Times. August 23, 2009. Archived from the original on November 27, 2013. Retrieved November 27, 2013. ^ Searle, Brenda (August 1, 2012). "Review: Sisterhood of Dune". Portland Book Review. Retrieved November 21, 2013. ^ a b "Official site:Sisterhood of Dune". DuneNovels.com (Internet Archive). January 2012. Archived from the original on November 13, 2013. Retrieved November 21, 2013. ^ a b Neuman, Clayton (August 17, 2009). "Winds of Dune Author Brian Herbert on Flipping the Myth of Jihad". AMCtv.com (Internet Archive). Archived from the original on September 21, 2009. Retrieved March 31, 2014. But we think there are perhaps three more Dune novels after Heroes. We may go on to the founding of the great schools: Dad says there are five, but we're going to do it in three. You've got the Bene Gesserit -- that would be The Sisterhood of Dune; then there's The Mentats of Dune and The Swordmasters of Dune. ^ Gencarelli, Mike (March 27, 2013). "Kevin J. Anderson talks about books Hellhole Awakening, Mentats of Dune and working with Rush's Neil Peart on Clockwork Angels". MediaMikes.com. Retrieved November 27, 2013. ^ a b "MENTATS OF DUNE final cover and jacket text". KJAblog.com (Internet Archive). November 15, 2013. Archived from the original on November 27, 2013. Retrieved November 27, 2013. ^ Gaffen, Adam (January 22, 2013). "A Conversation with Kevin J. Anderson". Amazing Stories. Retrieved June 5, 2015. ^ "Interview: Brian Herbert and Kevin J. Anderson on Dune". FlickeringMyth.com. April 9, 2014. Retrieved June 30, 2014. ^ Anderson, Kevin J. (November 25, 2014). "Brainstorming NAVIGATORS OF DUNE". KJAblog.com. Archived from the original on December 9, 2014. Retrieved January 17, 2015. ^ Anderson, Kevin J. (July 27, 2015). "Sneak preview of NAVIGATORS OF DUNE!". Twitter. Retrieved August 26, 2015. ^ Herbert, Brian; Kevin J. Anderson (2012). Sisterhood of Dune. ^ "Best Sellers: Hardcover Fiction: Sunday, January 22, 2012". NYTimes.com (Internet Archive). January 22, 2012. Archived from the original on November 27, 2013. Retrieved November 27, 2013. ^ "Best Sellers: Hardcover Fiction". NYTimes.com. March 30, 2014. Retrieved April 24, 2014.